The last couple of weeks I have joined various plant related groups and I have got in touch with some interesting people with whom I am planing to make an interviews in the near future. More I do not want to tell, you will see. Also I have acquired some new plants which you can see the upcoming weeks, I will be very curious to see the development of these plants and I will keep you updated. 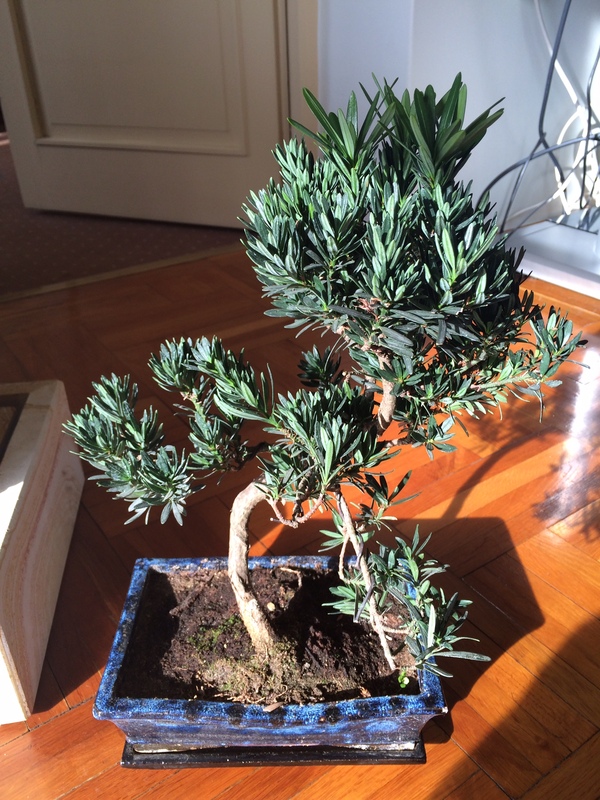 A new bonsai… from China! So here is a typical story about how I am buying my plant… 🙂 I was walking in my favourite garden center. I saw that the employees were packing new plants on the shelves and much to my surprise one of the section was for bonsai. I went there to talk with the employee who was packing the plants and much to my surprise I was asking about the plants and origin. It was a new shipment from China and Japan. I have got really excited and curious what the boxes held. After waiting couple of minutes and looking around I have found the perfect specimen for my future plans. My choice was a Podocarpus macrophyllus – also known as Kusamaki or Inumaki. Podocarpus macrophyllus (Kusamaki or Inumaki) is a conifer in the genus Podocarpus, family Podocarpaceae. It is the northernmost species of the genus, native to southern Japan and southern and eastern China. Kusamaki (クサマキ) and Inumaki (犬槇) are Japanese names for this tree, and Kusamaki is increasingly being used as the English name as well, replacing the old, botanically inaccurate names Buddhist Pine and Fern Pine (it is not a pine). In China, it is known as 羅漢松 or luóhàn sōng, which literally means “arhat pine”. It is a small to medium size evergreen tree, reaching 20 m tall. The leaves are strap-shaped, 6–12 cm long, and about 1 cm broad, with a central midrib. The cones are borne on a short stem, and have 2-4 scales, usually only one (sometimes two) fertile, each fertile scale bearing a single apical seed 10–15 mm. When mature, the scales swell up and become reddish purple, fleshy and berry-like, 10–20 mm long. It is a great tree, but it will take a while (means years :)), to make it a mature bonsai. It needs a lot of wiring and pruning to have its final shape, but for now I will wait for the spring to repot. 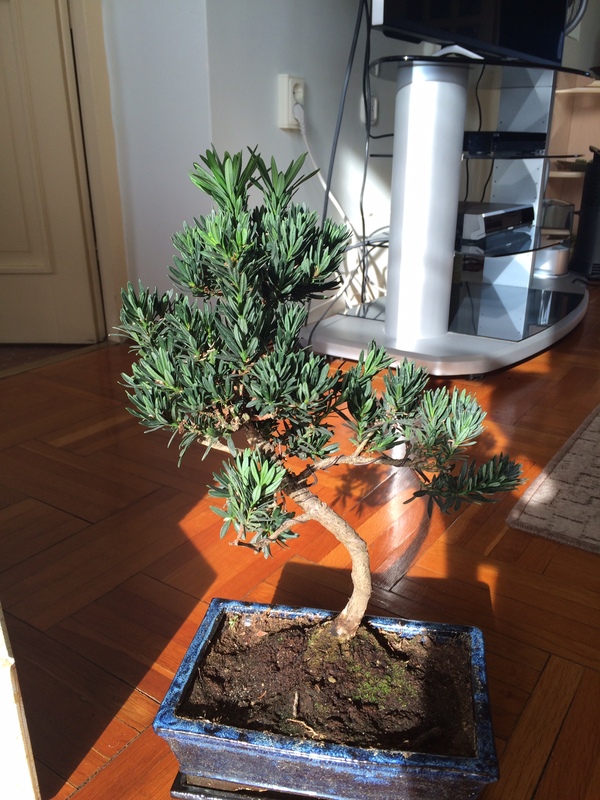 Finally I have made some pictures to show the new bonsai in my collection.